Thirumeyyam temple is situated between Pudukottai and Kaaraikudi. 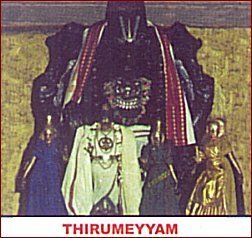 The sthalam can also be reached from Thirupathur or Trichy. The Moolavar is Sathyagirinathan, Sathyamurthy seen in standing posture facing east. The utsavar is Meyyappan. Theertham - Kadambha Pushkarini, Sathya Theertham. Srirangam is considered the most important among the Vaishnavite temples, known as the "Koil". The temple is situated between the rivers Cauvery & Kollidam, near Trichy. 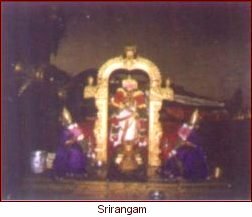 The Moolavar is Sri Ranganathar, (also known as Peria Perumal, Namperumal, Azhagia Manavaalan) who reclines on the Adisesha, facing South. The Uthsavar is Namperumal who gives darshan in the standing posture. It is the birth place of great Saints like Pattar, Pillai Logacharyar, Peria Nambi. There are sannadhis for Danvantri Bhagavan, Chakrathaazhvaar, Garudaazhvaar, Sugreevan, Angadhan, Sri Desikan. The 10 Alwars (Perialwar, Kulasekaralwar, Thirumazhisaialwar, Thondaradipodialwar, Thirupaanalwar, Thirumangaialwar, Poigaialwar, Boodhathalwar, Paeyalwar, Nammalwar & Aanddal) have sung 247 paasurams in praise of Lord Ranganathar. The temple is located at Thirunaangur, which is 5 mils from Sirgazhi. 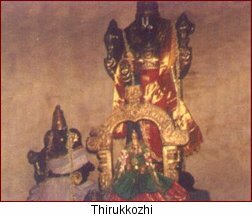 The Moolavar is Kudamaadukoothan (with Thaila Kaappu) seen in seated posture facing east. The Utsavar is Gopaalan with four hands. The Garuda Sevai on the day following Thai Ammavaasai is important. 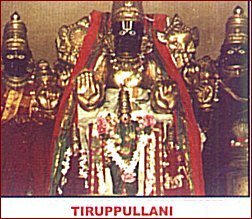 Thiruppullaani temple is situated near Ramanathapuram which can be reached from Kaaraikudi or Thirupathur or Maanaamadurai. The Moolavar is Kalyaana Jaganaathan seen in standing posture, Chakravarthy Thirumagan seen in darba sayana posture facing east. 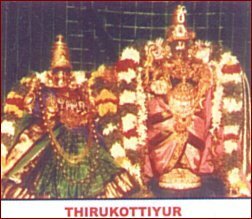 Thirukkotiyur temple is situated about 7 miles from Thirupathur near Madurai. The Moolavar is Uraga-mellanaiaan seen in bujanga sayanam posture facing east. The utsavar is Sowmya Naaraayanan seen in standing posture.